Optimize the execution time of many queries. Optimize the purge of data. Minimize the reconstruction of the tables in error during a crash of the DBMS. logs: event logs from the supervision engine collection. log_archive_host: availability data of hosts. 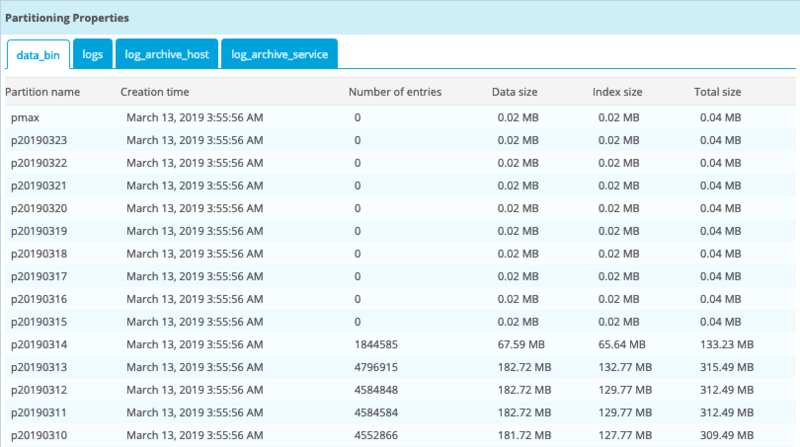 log_archive_service: availability data of services. More details about MariaDB partitioning here. If you install Centreon via the dedicated ISO, this parameter is already configured. If you do it on your RedHat or CentOS Linux version, you will be able to do it manually. Don’t forget to restart mariadb processes if you change this value in my.cnf. Retention duration for partitioning: retention time for partitioned tables, by default 365 days. Forward provisioning: number of partitions created in advance, by default 10 days. Backup directory for partitioning: partition backup directory, by default /var/cache/centreon/backup. Partitioning uses XML files in the /usr/share/centreon/config/partition.d/ directory to create the necessary partitions. The ‘SELECT INSERT’ statement will lock the table and maybe your production in some points (per example table migration of ‘logs’). The Centreon Database Plugin Pack allows you to control that the number of partitions created in advance is sufficient. It is recommended to install and deploy this Plugin Pack.